Authorities also said two prisoners involved in the March 27 incident were transferred out of the Al Burruss Correctional Training Center and the victim, Cortez Berry, is now in protective custody at another state prison. The Department of Corrections did not disclose the officers’ names or say whether they faced discipline before resigning. 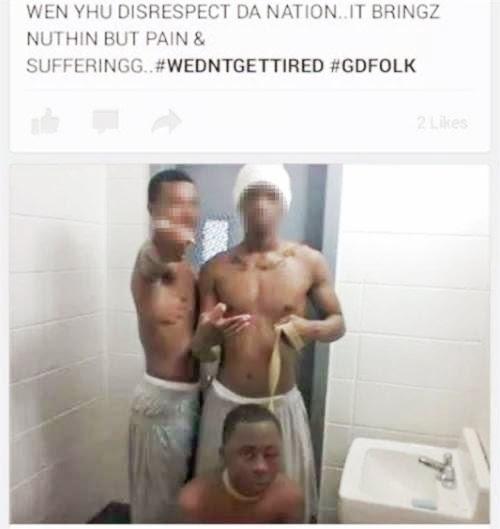 Berry’s family told NBC News last week that when they saw the disturbing pictures posted on Facebook and went to the prison to investigate, the guards were unaware that he had been beaten. The relatives were horrified that Berry was initially transferred to Smith State Prison, a notoriously violent lockup. Correction officials portrayed that as an emergency stopgap measure. Berry is now within protective custody at Macon State Prison, the agency said in a statement. The incident is still under investigation, the statement said. Berry was imprisoned at Burruss for violating probation on charges of juvenile aggravated assault, robbery and car theft. He told his aunt that the day before his 18th birthday, a group of fellow inmates tried to get him to join a gang called the Gangster Disciples, and when he refused they attacked him and took the photo. "No guard was there to help him," the aunt, Shavondria Wright, told NBC News. The case highlighted both violence in Georgia prisons and the growing use of smuggled cellphones by inmates, sometimes to commit crimes.